The independent lodging markets in Europe and the U.S. are huge, complex and underserved. 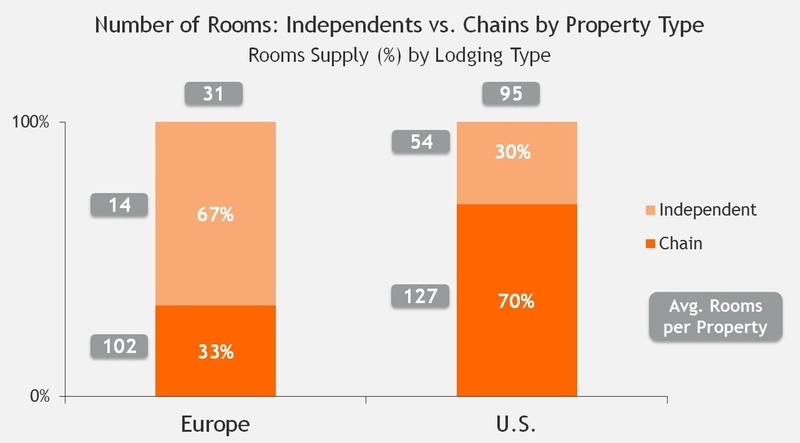 They are also unique – with independents representing 67% of lodging rooms in Europe but only 30% in the U.S. There are hundreds of thousands of non-branded properties competing for share in both markets – and their distribution and marketing strategies are not fully understood. With more than two-thirds of hotel bookings still being made offline, the global hospitality market represents huge opportunity for aggregators and online travel agencies alike. Full research results are proprietary to the study sponsors, but a Summary Report will be available for purchase by mid of November 2015. The report covers major European markets (U.K., Germany, France, Italy and Spain) as well as the U.S. Based on more than 2,800 online survey replies, the gathered information by property type (e.g., hotel, guesthouse, Inn, cottage, etc.) covers each market in detail. Market sizes by segments were obtained by using existing research, combined with data from major OTAs. View some of the key findings in our Infographic.